Sustainable Agriculture examines Cuba's response to the food crisis created by the collapse of the Soviet Bloc in 1989. At one time Cuba's agrarian culture was as conventional as the rest of the world. It experienced its first "Green Revolution" when Russia was supplying Cuba with chemical and mechanical "inputs." However, the collapse of the Soviet Union in 1989 ended all of that, and almost overnight threw Cuba's whole economic system into crisis. Factories closed, food supplies plummeted. Within a year the country had lost over 80% of its foreign trade. With the loss of their export markets and the foreign exchange to pay for imports, Cuba was unable to feed its population and the country was thrown into a crisis. The average daily caloric intake of Cubans dropped by a third. Without fertilizer and pesticides, Cubans turned to organic methods. 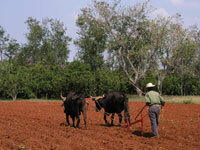 Without fuel and machinery parts, Cubans turned to oxen. Without fuel to transport food, Cubans started to grow food in the cities where it is consumed. Urban gardens were established in vacant lots, school playgrounds, patios and back yards. As a result Cuba created the largest program in sustainable agriculture ever undertaken. By 1999 Cuba's agricultural production had recovered and in some cases reached historic levels. Pt. 2 Health Care System - In spite of the economic crisis and US embargo, the Cuban health system is an outstanding success story around the world. "Anyone interested in ecologically sustainable development and humanity's future in the context of depleting resources in the 20th Century will find this documentary thought provoking." "If necessity is the mother of invention, then this vivid and beautifully filmed documentary shows how the Cuban people have faced adversity and austerity with a dogged inventiveness since the collapse of the Soviet Union and the start of the 'special period' beginning in 1990. The film will be especially useful and instructive for viewers looking to solve the riddle of how Cuba has survived a depression-like upheaval while struggling to maintain enviable standards of social security for its people." "A useful film for undergraduate and high school teaching of human geography and agriculture...Raises some useful questions and offers possible solutions for students of international development...What was the impact of the reforms? How self-sufficient is Cuba today in terms of essential foodstuffs? What basics does Cuba still need to import (rice, beans, meat and dairy products, vegetable oils, livestock feed)? How do nutritional intake levels compare with needs? How does Cuba compare with other Latin American countries? How has the balance between social equity and personal liberty been managed? And what have been the consequences of policies implemented; in terms, for example, of contentment, migration or the open and hidden economies?" "Engaging, substantive....Both parts of this visually pleasing documentary would make an superior accompaniment to print materials in classes on Caribbean history, international health or social welfare." "An excellent account of a sophisticated and sustainable farming strategy, which could be taken by other countries as a model for a climate-changed, post-oil world." Interview with Dr. Fernando Funes Sr.